The Quietline Noise Reduction System is a set of noise-suppressing modules that treat line noise and interference throughout your home to reduce the noise from computers, digital clocks, power tools and other offending appliances. 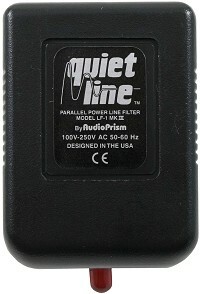 The Quietline System is a whole-house treatment for noise. Your audio equipment is constantly bathed in a sea of electrical noise. Most line filters treat only the power coming directly into the equipment. They do nothing about the noise generated by other electronic devices. The Quietline Noise Reduction System is a new way to reduce the electrical noise and interference that degrades the sound of your audio system. The Quietline System is more effective than conventional filters because it reduces noise at its source. It sits across the power line, rather than in series with it, cleaning up noise and interference without affecting the flow of power to your electronics.